I am a Certified Specialist in Bankruptcy Law*. 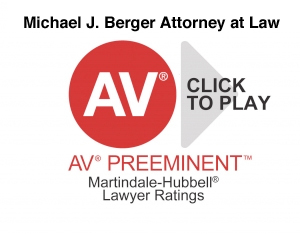 I am an “AV”* rated attorney with 37 years of experience in solving bankruptcy problems. I am a Mensa certified genius with a strong ability to analyze and solve problems. If you are being hounded by creditors, I can legally erase your debts and get you a fresh start. If your business needs reorganization, I can give you protection from your creditors while you reorganize. If you have a claim against an individual or company that has filed for bankruptcy, I can help you collect to the maximum extent possible. My fee is always much less than I save you. My initial consultation is always free. I represent debtors and creditors in Chapter 7, Chapter 11 and Chapter 13 bankruptcy proceedings throughout Southern California. I know the law and I know the courts, the judges and the trustees. I know the local rules and I know the other local Los Angeles bankruptcy attorneys. I can guide you through any bankruptcy proceeding. Filing bankruptcy is complicated, but I can make it simple for you. I use state-of-the-art technology to help my clients, including Best Case Bankruptcy Software, Legal Solutions Plus, Lexis Nexis Research Software, Adobe Acrobat Pro DC, Inforuptcy and the United States Bankruptcy Court’s Public Access to Court Electronic Records (PACER) system. This system enables me to review and print out detailed information on all recent bankruptcy cases. I use CIN Legal Data Services to instantly get your credit records upon your request to aid in the preparation of your bankruptcy schedules. All of my employees use ACT! Premium Version 20 to manage our contacts and calendar. All of our attorneys have Smartphones so that we can receive and reply to client calls, e-mails and texts even when we are out of the office. I handle emergency cases that other lawyers refuse to take. In 37 years of practice, I have been 100% successful in stopping foreclosures, even when I have been hired one day before the foreclosure sale. If you are considering filing a bankruptcy and would like to discuss the specific facts of your case, please call me now at 310-271-6223. I check my messages and e-mail throughout the day and at night and on weekends too. I return all calls and e-mails promptly. We are fluent in Spanish, Korean, Farsi, Armenian, Russian, Hebrew, Vietnamese and Khmer (Cambodian). Open Monday through Friday 8:00 am to 7:00 pm and on Saturdays from 12:00 noon to 5:00 pm.